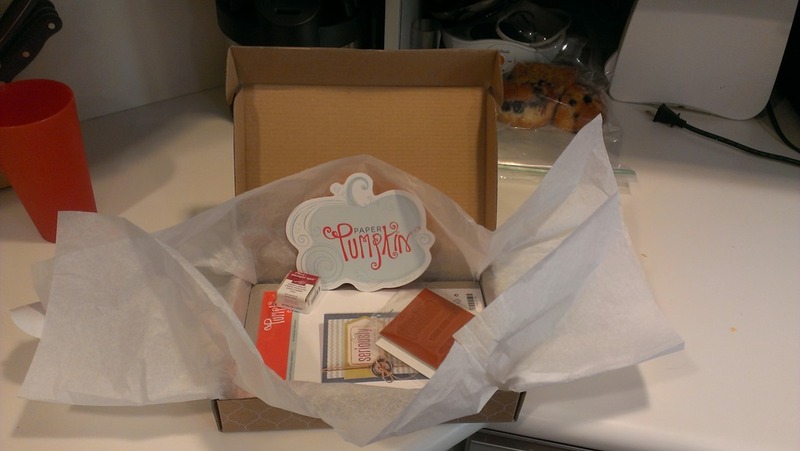 Have you heard about Paper Pumpkin yet? 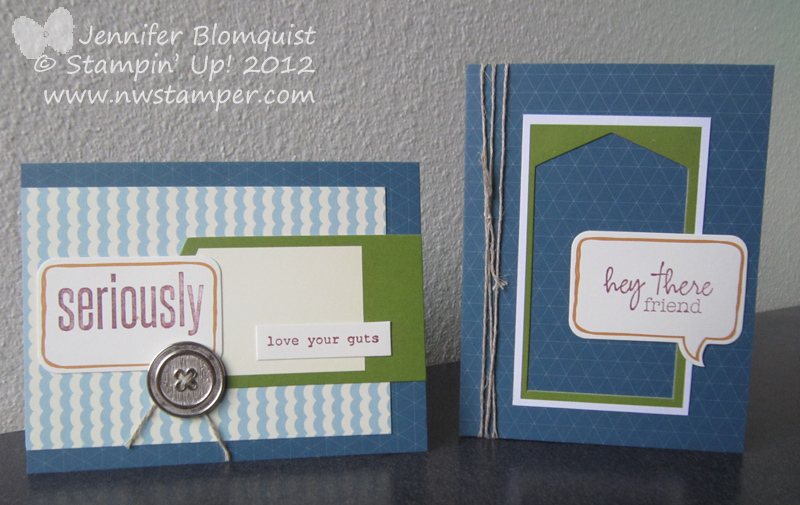 If not, here is the quick skinny on this new offering from Stampin’ Up! Each month you are subscribed, you will receive a Surprise Box full of everything you need (except adhesive) to create some fun project. They started the program in March 2013 and so March was the “Welcome Kit” which included a clear block and everything you needed for 4 cards. Then in April, they sent out the first wave of boxes that were a complete surprise to everyone! It has been interesting to watch the reactions to this new kit. Some people LOVE the 4 card kit that we received. 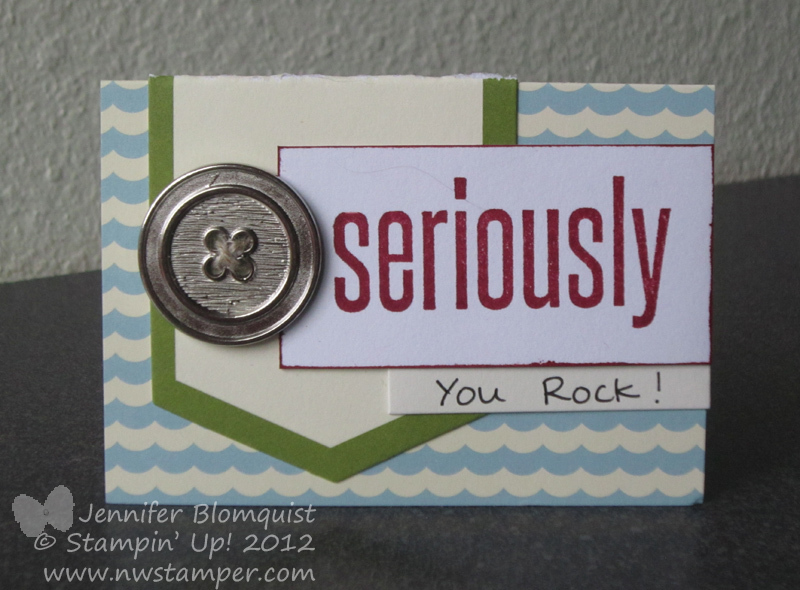 It has the fabulous Silver Designer Buttons in it along with some funky designs and elements. However, others have been less keen on the stamps that were included. The sentiments were “Seriously”, “you kick booty”, and “love your guts”. Personally, I found them kind of fun but I know not everyone will find these sayings appropriate to send to family or friends. heck, even …. Seriously, thanks so much! But with each month, I challenge myself to not only make the project as designed in the kit, but to change it up and come up with some other ideas using the supplies found in the kit. I know you can make even more cool projects if you incorporate other supplies as well, but for now, I’m trying to stick with just the box. Curious about trying it out? Then, the next month you will get the same surprise box that we all receive around the 15th of the month. You just have to be subscribed by the 10th of the month. If you don’t want to continue or need to pause for a little bit, you can always do that! Now I’ll be honest, these are great to have as kits for something small and compact to take with you when you need something to do but don’t want to cart around your full craft closet! But they are quick and simple projects. However, that means they are perfect for giving as gifts to teenagers, parents, friends, etc who want to be crafty but don’t have the money, time, or space to start collecting all the supplies you might want. These are a great way to try it out and keep it compact in regards to the amount of stuff you have left over! This last week, I have been performing my civic duty by heading to the district courthouse each morning to report for jury duty. Most people are not excited by being called for jury duty, but with two overly energetic toddlers in the house and a mom who offered to come help watch the kids, I was actually looking forward to the relative quiet and time away. But I knew that there was likely going to be times when I was sitting around waiting and so I wanted to take something with me to keep me entertained. 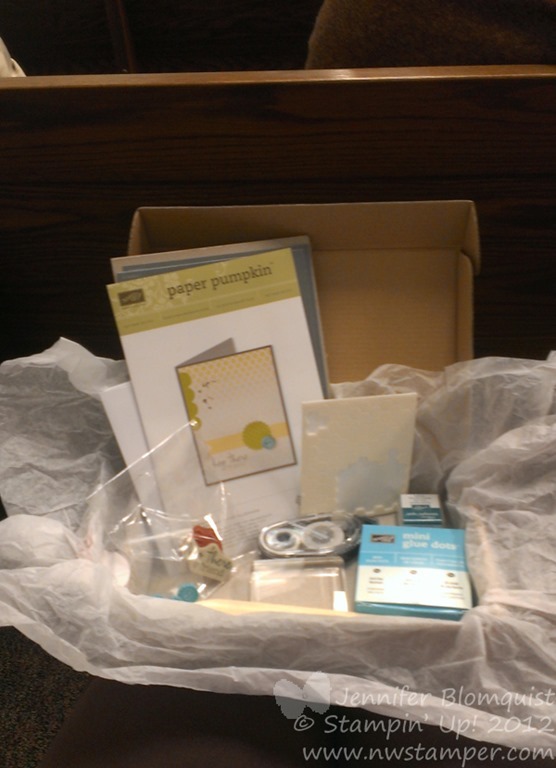 And then it hit me the night before I was due to report and I was trying to figure out what I could grab to make my own crafting kit to go — why not just take my “Welcome Kit” box from My Paper Pumpkin? All I needed to do was throw in some adhesive and my bone folder and I was ready to go! So that is exactly what I did! This is me sitting in our waiting area bench getting ready to start. I found that the box, when closed, makes a fine table for assembling. And here are two more designs I came up with while playing around. I ended up using all of the contents of my card with the exception of part of one of the green scallop stickers. But I love that each of the cards is just a bit different from the other. 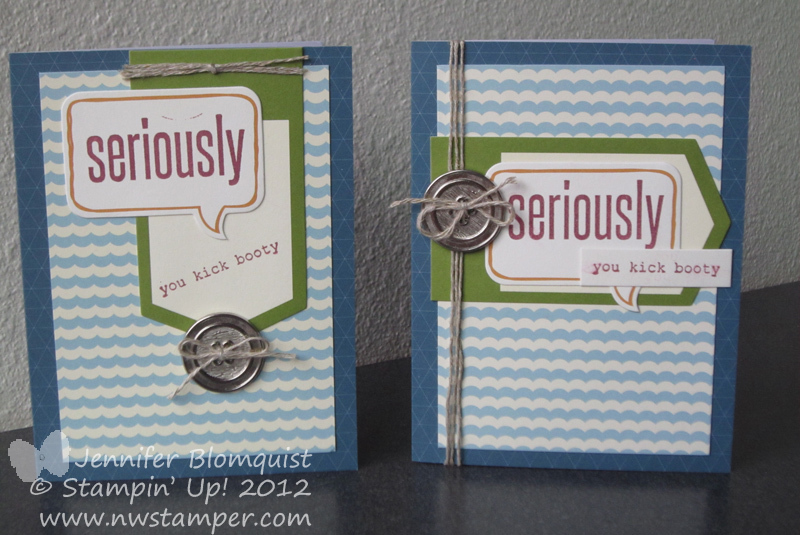 If you had other stamps at home, change up the sentiments or start adding even more embellishments for even more options. Have you signed up for My Paper Pumpkin yet? Did you get your bonus? Remember, you need to be signed up by Sunday, March 10th to make sure you get your Welcome Kit in mid-March and receive the new project kit in April! If you sign up after the 10th, you will get your welcome kit mailed out in mid-April and then start receiving your regular monthly project kits in May. 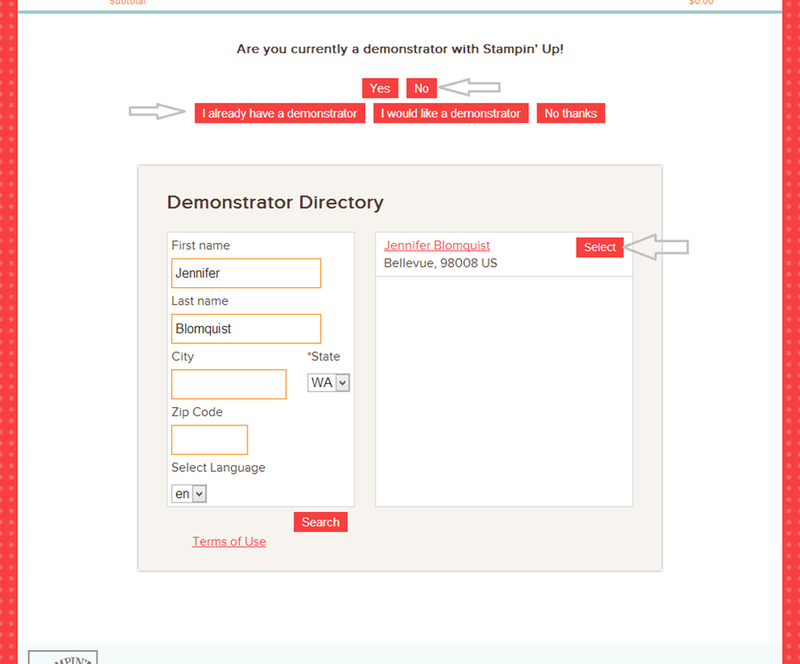 Please make sure to select your demonstrator when you sign up too!